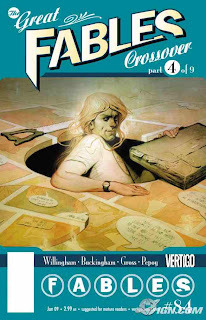 Last September, Fables fans got a bit of a shock. 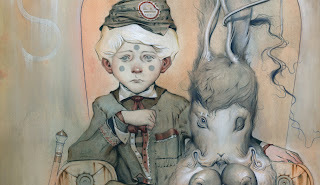 After 81 issues, Eisner-winning cover artist James Jean was leaving. The man whose work was infamous for his dazzling Fables iconography was moving on, and everyone wondered who would replace him. Time has passed, and we are happy to announce that the new cover artist for the Fables series is none other than Brazilian artist Joao Ruas, whom we just started working with here at Thinkspace during The Drawing Room exhibition. 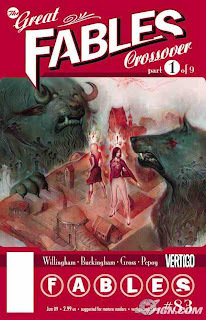 Ruas’ first cover will be for April’s issue #83 (shown above), which is the first part of “The Great Fables Crossover”, a nine-part story arc which will see Jack of Fables and Fables interact for the first time. A glimpse at Ruas’ second cover, for issue #84, is shown above. Look for more great new works to arrive soon to our gallery from Ruas, as we work towards hosting his debut Los Angeles solo show in the spring of 2010. The beautiful work we took to Art Basel – “Scowrer” – is still on hand (view a close up below). Please inquire if you are interested and view all our available works here.